While speaking to a friend of mine about the current burro situation, she had a brilliant idea. Neither of us knowing who to contact, I decided to reach out to you (and will also do so via the account we are connected on and possibly email if no response). Among the best of the ideas I have heard, putting lights, solar or of any kind, on the parkway seems to be the most logical however extremely costly for our city and taxpayer dollars. I have seen a lot of ideas but one that stands out the most and would cost a lot less, tagging the burros. Not only with a name/number but the actual tag itself can be made of reflective materials. Just like a mile marker post. Though it is not the end conclusion or “problem solver”, you must admit it is a step in the right direction. 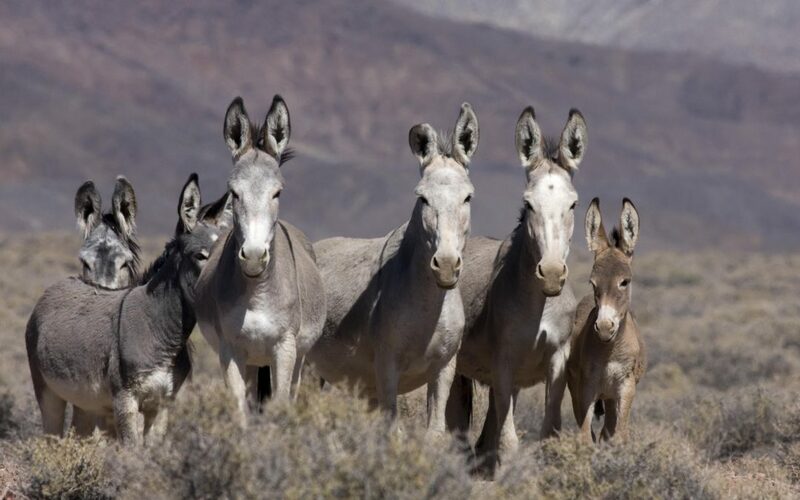 Multiple people, as well as burros, are injured if not killed every year, and with new construction, especially with the new Laughlin Ranch Boulevard, there will be more fatalities. It is only a matter of time before something most definitely must be done. Thank you for listening Mayor Brady. –Michelle Crider and Theresa Albrecht, both of Bullhead City. I believe the reflective tags are a unique and great approach to an extremely difficult situation. Tagging both ears would insure 2Xs the chance that they will be seen in enough time to slow / stop to avoid these horrible accidents. Since burros do not have reflective eyes like a predator they are difficult to see until you are upon them. Some of the hills and curves on the parkway are completely blind spots until you crest the berm or the corner. At that point it may be too late for you to act accordingly. Due to the lack of visual distance. The reflective devices will be a preventative alert, similar to that of a construction workers vest or a runners shoes or active wear. Kudos to you and your friend for this idea. I believe the next approach may be to the BLM or Arizona’s Fish and Game. I think a fence would work better. Tagging and putting reflective signs on them could interfere with the natural movement of the burrow. Could get cought on something. Not to mention there is more than one heard of burrows. I think it would be difficult to tag them without spooking them and have them run toward the roadway. It’s a step. Question? Are there eater guzzlers on threader side if the desert as the burros are looking for water. https://youtu.be/5W2yPwgh96g This is a link of tagged burros in another country, I brought this up a few years ago but nothing ever became of it. Burros are federally protected. Mayor Brady can’t do anything in regards to capturing the animals and tagging them. The BLM is the lead agency for feral horses and burros. The reason I felt compelled to write you is people need to be aware of the possibility of Cattle on this highway we have been coming to the river for over 50 years , we had no idea there where farmes out here .back tracking our route in the daylight we found only 1 sign allerting drivers miles back in Erinberg another about 1/2 mile from our accident on the California side! Going the other way! We recently moved here and call me a City girl if you want but I had not a clue these animals where out here . still processing the fact that We hit a Bull. Before we left that day we seriosly contemplated taking our 86 Corvette , thank God we didn’t . As I am sure we would not be here today it was like hittling a solid wall I am so thankful we survived but I can’t help but think about other drivers , it could have been anyone on that road please put up more signs ranchers please patrol and repair your fences and drivers please slow down and stay alert I think reflectors are an excellent precaution heres another suggestion there are irrigation canals all over the area how about between the fencing and the highway still leave a shoulder but pit a body of water between the fence and the highway that may stop coyotes it not may not stop smaller animals but certainly stop cattle from enering the highway, colliding ,with a coyote orRabbit won’t nessesarly cause the injuries that hitting a 2000 lb Steer would.